If you’ve never visited Iceland, it’s remarkable to see how much its landscape differs from that of the UK considering its capital, Reykjavik is little more than 800 miles north from Glasgow in Scotland. However, its geographical position has much to do with that with Iceland being tethered out in the middle of the Atlantic and just south of the Arctic Circle. Winter holidays to Iceland are a geologist’s paradise and you can travel around and see contrasts ranging from bubbling volcanoes to frozen wastelands and there’s plenty to see and do. Much of Iceland is unspoilt wilderness and appears just as it would have done over 1,000 years ago with much of its vast interior uninhabitable. With parts of the country covered in snow for more than half the year, Icelandic people see skiing as part of their way of life as much as an activity and there are plenty of ski resorts to choose from. The most popular are Bláfjöll and Skálafell near Reykjavik. This is probably the most photographed image for anyone who has taken holidays to Iceland. The waters here really are a surreal blue, almost fluorescent to the naked eye. Many people describe the colour as a ‘frosty’ blue but the lagoon is anything but frosty with it being a thermal pool where people can bathe in temperatures of up to 40C (104F). Its mineral rich waters are also reputed to have healing powers. Lake Myvatn is the north of the island’s equivalent to the Blue Lagoon and it’s situated a short drive from the airport at Akueyri. It’s a natural choice for visitors with its extraordinary beauty of both volcanic and geothermal properties and Myvatn itself is still an active volcano although it hasn’t erupted since 1984. In addition to the hot springs, you can experience sizzling mud pools and hissing steam vents. 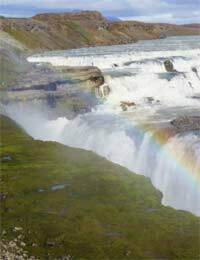 Reykjavik is the capital of Iceland and is also where most of its inhabitants reside. It offers magnificent hotels and fine dining experiences and a thriving night life scene as well as being on the doorstep for much of Iceland’s stunning natural scenic beauty. The bewitching spectacle in the night sky of the Northern Lights (Aurora Borealis) can be viewed from Iceland. The best time to travel to see them are during the darkest periods between November and February although they can be viewed from as early as late August and as late as mid April. Horse riding is another popular tourist holiday attraction and several places run schools year round where you can ride along the shore whilst watching seals playing in the sea although some horse riding centres close for the winter months so check first. Both British Airways and Icelandic Air run regular scheduled flights between the UK and Iceland and Iceland Express is a smaller budget airline which operates between Reykjavik and London’s Stansted airport. Iceland can experience very cold air blasts from the Arctic, especially over the winter months and it can often snow. However, the capital, Reykjavik is ice free throughout the year but temperatures hover around freezing. However, such is the fickle nature of the weather in these parts that there is a very famous quotation which goes, “if you don’t like the weather right now, just wait five minutes” which is an apt description of just how variable the weather in Iceland can be. Nevertheless, for sheer natural beauty and unspoilt wilderness, holidays to Iceland are something you should experience at least once.